As I am just starting to plan a wedding the fiance tells me the other day that it might be time to move. Normally I would be all over this, I mean a chance to decorate a new place would be great! But, since we live in a place that is on the larger side just on the edge of the city, the only way I am moving if it is closer to downtown (think Back Bay or South End area) and that means less space. Nothing is for sure yet, but I can't help to start thinking about how I could get creative with space and add much needed storage. The first inspiration place that came to mind was the Manhattan apartment Rashida Jones lives in that was featured in Domino. She used her space wisely and created a built in look by flanking her sofa with two bookcase storange cabinets that are PERFECT for an apartment. With the addition of two wall sconces attached directly to the bookcases it eliminates the need for lamp space. I love the closed storage cabinets on the bottom half, perfect for that messy storage you dont want everyone seeing. Behind the curtains are more storage shelves. She really crammed as much storage and used as much vertical space and she could. 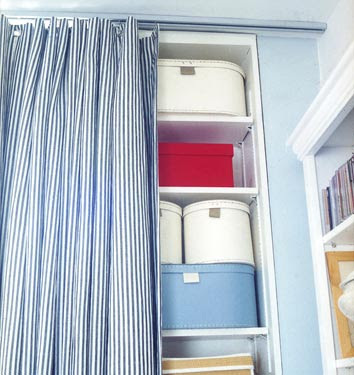 behind the curtains reveals pretty storage boxes, they are even matching! I can only hope that if the fiance and I decided to move we can make use of our space as well as they did here. We sure will need all the space we can squeeze. such a great apartment with fantastic storage! great for an apartment or small home! oh man...for real? well it's kind of exciting and now you can search for all the things you'll need to register for. YAY! love the colors in this space- feminine yet not over the top at all! I loved this issue... still so sads about domino. I am moving to NYC and the space is as big as a shoebox...I feel like I have to sacrifice good design for practicality. Very exciting stuff happening for you, I am sure you will make the most of the space, even if you have to go smaller! It will be a little challenge but you will make it work! I mean how stinkin cute is this place!!! I remember this spread from Domino and I loved it. Thanks for posting it so I could relive it! I love the sofa in these photos! I lived in DC for years and am moving back soon so I feel your pain about downsizing. It's all about decorating vertically not horizontally! Seriously, you would be so surprised how creative you can get in a smaller place. Basically everything I own doubles as secret storage!! yup, this looks right up your alley! with the move and all. Her color choices are just divine! i have always loved this space. so fun + bright. great ideas for space..huh? 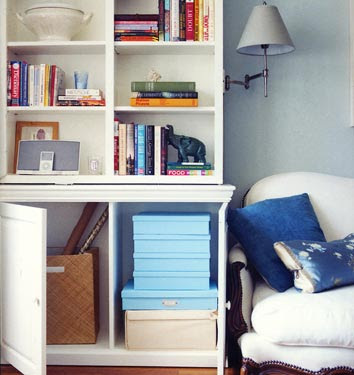 I just love small spaces- love to see ppl's creative ways to organize. This apt is great! And I really, really like the sconces on the sides of the bookcases. this is how to make it work, gorgeous. I am wanting to downsize to a cottage, but I think my down size and yours may be a bit different, ha! couldn't imagine in a city. when I have a baby you're going to need to move so I can have your apartment:) then you can have a baby and move upstairs to the bigger place and we can do laundry together with rollers in our hair:) GET EXCITED ABOUT MARRIAGE!! Mmm an oldie but a goodie - I always love seeing that apartment again and again!! Love the white and plum and peacock blue! AND very exciting about the moving plans on top of everything else. Lots of fun change! Lots of changes for you! What an exciting time. Her apartment is one of my faves. So much style in such a small space. I love her! Her apartment is so cute! I understand the city moving thing, it's always a tradeoff between space and location! I remember this apartment! What a great use of space. I wish I'd known more about decorating when we lived in our 600 sq ft apartment in the South End. Looking back, there's so much more we could have done with it. Oh my goodness, congratulations! Sorry I'm behind the times but I just noticed you referring to your fiance and had to scroll back to get the scoop...love the Mikes Pastry box!! Hands down one of my favorite organized spaces in Domino. I still want all her storage containers. I know, it's sick. I really HOPE you move closer to me! That would be so exciting! Rashida has such great style. Love her in Parks & Rec too- that show is hilarious!